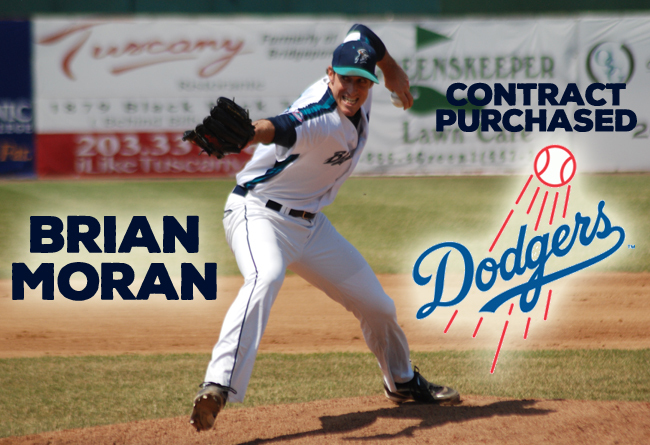 (Bridgeport, Conn., July 17, 2017) – Bridgeport Bluefish team officials have announced that left-handed pitcher Brian Moran has had his contract purchased by the Los Angeles Dodgers organization. He will report to Double-A Tulsa of the Texas League. Moran has made 29 appearances with the ‘Fish in 2017, earning a 2.33 ERA with 33 strikeouts across 19.1 innings. In 2016, he made 38 appearances for Bridgeport and collected a 3.12 ERA and 42 strikeouts in 34.2 innings before he had his contract purchased by the Atlanta Braves organization and was assigned to Triple-A Gwinnett of the International League. Brian is the fourth Bluefish player to have his contract purchased during the 2017 season. About the Bridgeport Bluefish The Bridgeport Bluefish are members of the Atlantic League of Professional Baseball and play their home games at The Ballpark at Harbor Yard. For further information, call 203-210-BLUE (2583) or visit www.BridgeportBluefish.com.